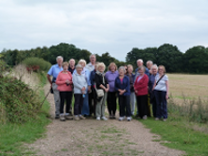 Meeting on the 2nd and 4th Tuesdays of each month, Strollers Group 2 walks between 2½ to 3 miles, normally taking about 1½ to 2 hours and finishing with an optional pub lunch. This is a very social group who enjoy chatting en route and taking in the local countryside. Strollers 2 has vacancies for new members. January 8th Coach & Horses, Oxford Road, Sutton Scotney. January 22nd Abbots Mitre, Chilbolton. February 12th The Hatchet Inn, Lower Chute. February 26th The Hare & Hounds, Charlton Down. March 12th The Old Bell & Crown, Hatherden. March 26th The Hawk Conservancy Trust, Weyhill. April 9th The George, Vernham Dean. April 23rd The Cricketers Inn, Easton. June 25th Coach & Horses, Oxford Road, Sutton Scotney. Page last updated 19 April 2019 by Jan Ward.